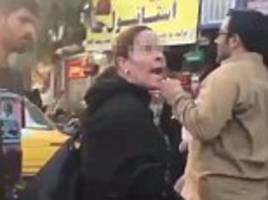 Footage has emerged of a Muslim woman challenging a cleric in the middle of an Iran street, ripping off her hijab and storming away. Women in Iran walked in public without hijabs to protest the compulsory hijab law in the country ahead of International Women’s Day, activists said. The videos were released around the 40th..
Women in Iran walked in public without hijabs to protest the compulsory hijab law in the country ahead of International Women’s Day, activists said.The videos were released around the 40th..